Exclusive King James Sunday School Curriculum is hard to find! I did research and asked friends what they use to be able to compile this list. I want you to know that the majority of these curriculums are written by Baptists. 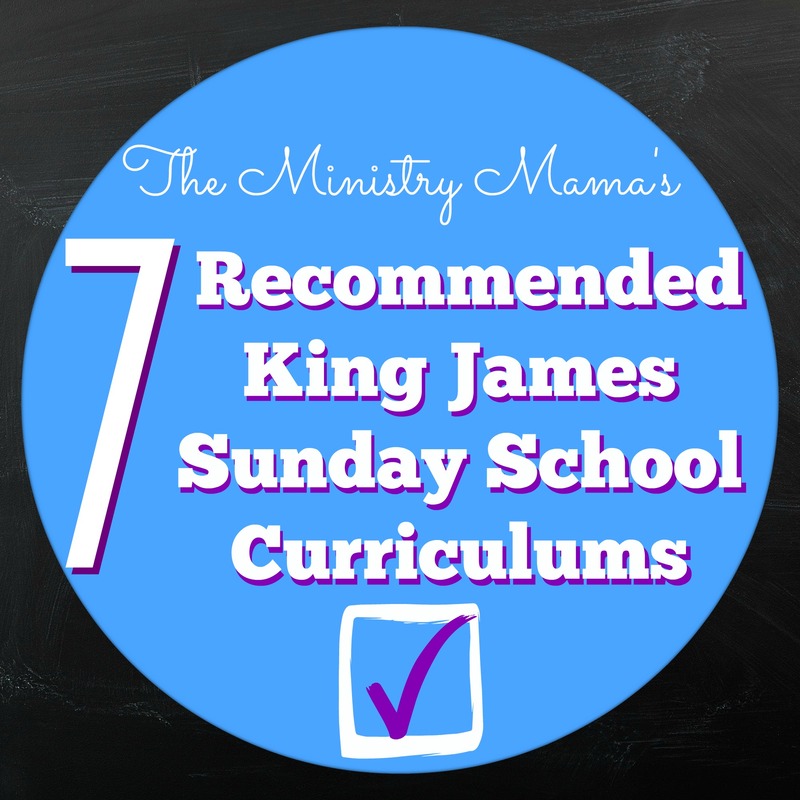 The other curriculums I have used before that have been doctrinally safe, so that is why I recommend these 7 Sunday School Curriculums. Glow Publications Junior Church Curriculum Guides – I have heard great things about this curriculum from a ministry friend of mine. I first became acquainted with this company through their monthly devotional booklets for teens, and now I see they also have devotional books for children. I always enjoyed the stories inside the devotional booklets because they gave great application to Biblical truths, so I am sure that their Junior Church curriculum will be great as well. Cost $1.60 for a downloadable .pdf file or a booklet for $5 to $7.50. Regular Baptist Press – I have also used and taught some of the 2’s and 3’s curriculum for Junior Church. In my experience it has good take home papers and visual aids to help me teach. I like how the teacher’s guide helps me come up with activities to reinforce the lessons. You can find curriculum for a range of different age groups to choose from under the Sunday School tab. Make sure to look for the KJV materials, because they also sell curriculum containing other translations. Teacher’s Guides $6.99 Teaching Resources Packet $16.99 Take home papers also available at a fairly low cost. Striving Together Publications – 5 Different Curriculum packets are available including: Stories of Grace, The Sacrifice of Our Saviour, The Signs of Our Saviour, The Steps of Our Saviour, and The Stories of Our Saviour. Our church has used this curriculum in our summer Wednesday night program for kids and it has been easy enough for our teens to teach the kids about the Bible. Teacher’s Edition Books $16.95 and Visual Aid Packets for $34.95. Other teaching resources are available. *Note: A friend of mine mentioned that not every story in the curriculum is included in the Visual Aid Packets, so this may be something you want to keep in mind. Bible Basics KJV Curriculum has a great range of curriculum – Preschool, Kindergarten, Beginner, Primary, Junior, Young Teen, Teen, Young Adult, and Adult. You can find this easily under Church Supplies, then Sunday School Curriculum. Teacher’s Guides range around $4.50 and Visual Aids cost around $8.50. They also have Make & Take booklets for many age groups for as low as $3.15 each. This website, The KJV Store is run by a distant cousin of mine that only sells KJV products in their online store. Joyful Life Sunday School Curriculum – Teacher Guides cost $6.95 and Posters for teaching cost $11.50-$22.75. The Joyful Life website allows you to view many pieces of the curriculum and has a downloadable order form. If you would like to make your purchase a little more simple, visit Christianbook.com. Joyful Life also has a good choice of visual songs available to teach in your class, this curriculum is published by Abeka. Accent Curriculum can be ordered easily from SundaySchoolDirect.com but viewed best at SundaySchool.com where you can also try sample lessons. The Teacher’s Manuals cost about $7.45*, Teacher’s Resources book is $16.50*, and the Classroom Kit (including Teacher’s Guide) costs $28.99*. This is a curriculum that I have worked with before in Junior Church for 4 and 5 year olds. It was easy to teach the kids because the visuals and teaching suggestions are full of help for the teacher to come up with ideas, songs, or games to reinforce the lessons. *Prices vary between the two websites. Bible Characters Curriculum. There are 5 volumes for the Bible Character Series for $15 each. There are around 25 lessons per book that focus on a Bible person and a specific character trait associated with each lesson. There are many other options available from this ministry in Kokomo, Indiana in their Ebay store. This curriculum came highly recommended from a ministry friend in Utah that has used 4 of the volumes to teach through an entire year. She liked that it was good for 8 year olds and up because it has activity pages included. She did say when she worked with younger children she would just find a coloring page online to print that was associated with the lesson. As you search for the perfect curriculum for your church ministry I challenge you to get samples if you can, borrow from friends, ask questions, do your research before you take the plunge and buy. You want to find something that matches your Biblical beliefs, teaching style, and will help you be able to have the resources to teach your class whether it is big or small. My greatest recommendation is to take the time to pray and ask the Lord what materials He would like you to use. Teaching what God wants you to is the most important thing of all! As always, if you have any other suggestions please do not hesitate to contact me.